Description: This plan is the two bedroom version of Enviro Dome. It is the same plan except there is a second bedroom dome and closet added on the right. Compact, but highly livable, the Enviro Dome 2 has everything you need. Three lofts add 371 sq. ft. extra space for sleeping, home office, living or storage. Additional storage options include space inside benches, a cedar chest at the foot of the bed, and an armoire north of the bed. A larger optional dome behind the master bedroom could include a walk-in closet, larger bath and laundry. Both Enviro Domes are perfect for the beginner do-it-yourselfer who wants to build their eco-friendly home at the lowest possible cost. 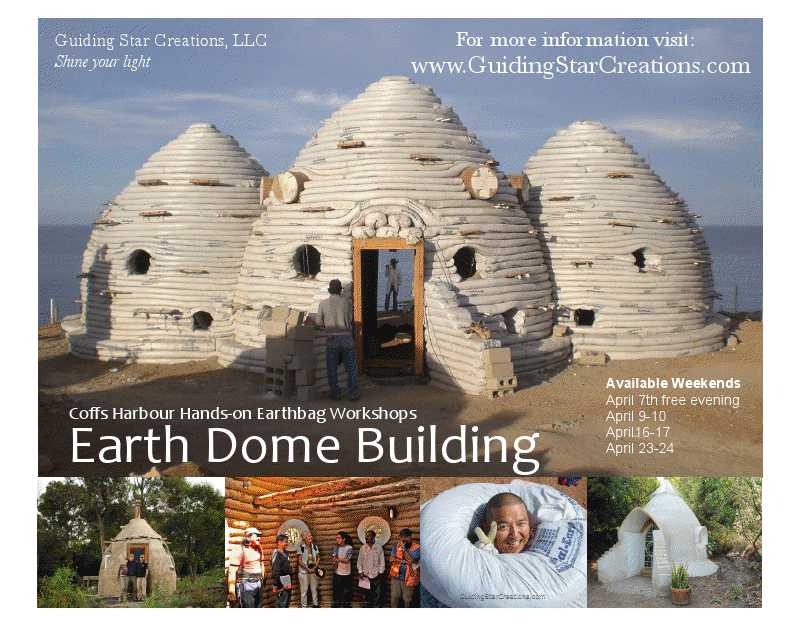 The Enviro Earthbag Dome is available, but not Enviro Earthbag Dome 2. Kelly hasn’t added it yet. In fact, there’s quite a few plans missing. I’ll email him about this. As drawn, how many of the regular bags & barb wire would you estimate it take to build the Enviro Earthbag Dome2? Also , I didn’t see the plan either over at dream green homes. You’ll have to calculate the estimate. Search our Earthbag Building Blog for the phrase “how many bags does it take”. I just emailed Kelly and asked him to add this plan to his site. Would it be possible to have the center dome go down into the ground for a basement with the same size footprint? I live in Missouri and moisture in basements is a problem. 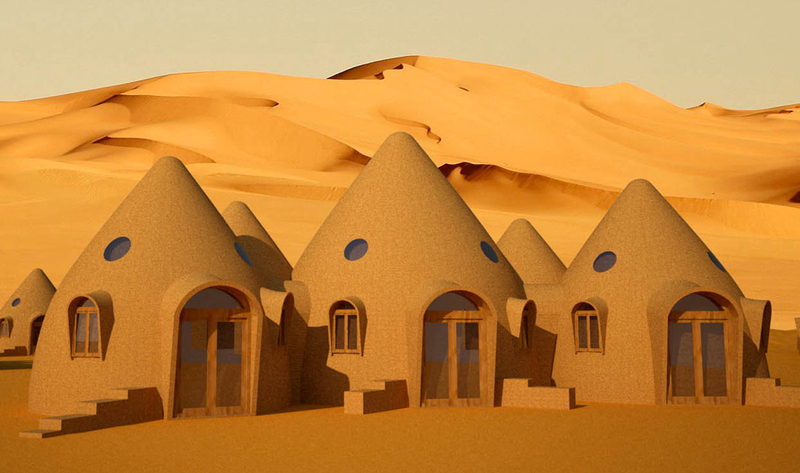 I was thinking about the lower level being constructed with rammed-earth tires and using earthbags for the above-ground dome. Also, removing the loft in the main dome to allow it to be completely open with skylights for the living area and kitchen. Do you think this would be possible? Would the tires be better at supporting the weight of the above-ground dome than earth bags? Should the basement walls have a very slight convex curve against the outer earth for better structural integrity or could(should) they be straight? Basements are not recommended where there are water problems. So no, building below grade in your area is not recommended. Tires are not needed. They’re much slower to work with and create wider walls that don’t match the thickness of earthbags. You can remove the loft, but you’ll lose some strength. The loft also serves as scaffolding while you’re building. Do you think it’s OK for the climate in Maine USA ? I like these better than “Earthships” as they do not use toxic tires, seem less laborious, and seem much less expensive. I suggest starting out with a smaller dome of the same shape. Use it as a tool shed, etc. That will give you a chance to perfect your techniques. 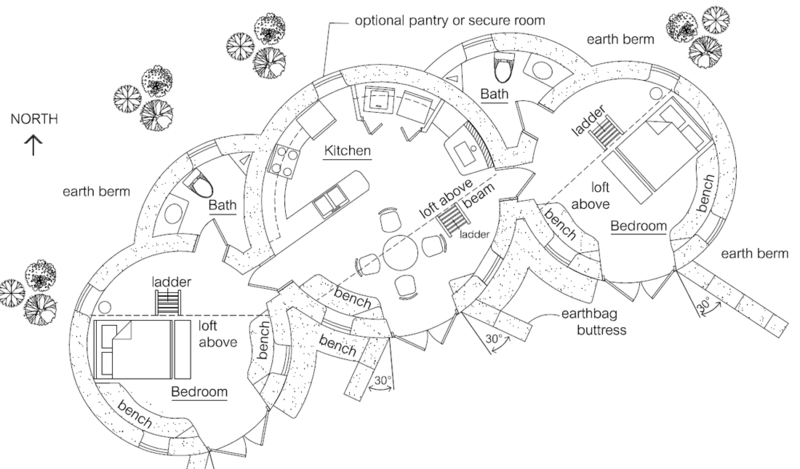 You can add everything the same as earthships, only this is faster and easier. One secret is using lightweight bags of insulation like Kelly. do you have a particular reason for using lofts instead of a full second floor? It’s nice to be able to look up from below, more lift gets into the loft, and it improves air circulation. Where can I purchase the plans for the envirodome 2? Not all plans are shown, so email Kelly if you don’t see it. Florida is one of the strictest states in the US for building codes. Don’t buy plans until you get the code issue worked out, or you hire Structure1.com who can get it code approved for sure. I just aquired an acre of land in levy county.. I hope that I am able to use one of your plans to build on it! Fingers crossed!